Tarpon Springs, FL. 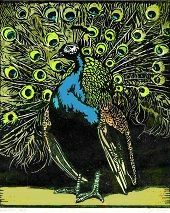 -- If you have never really understood what makes a fine print special, a visit to "Color Woodblock Prints" at the Leepa-Rattner Museum of Art will educate you in a direct, accessible way. The collection from the Two Red Roses Foundation has a specific viewpoint: It is composed of prints made mostly between 1900 and 1930 by a group of artists associated with the American arts and crafts movement using only the technique of woodblock printing. But it makes obvious the reasons why an individual print, though usually one in a group of multiples, can be unique. Arthur Wesley Dow (1857-1922) was responsible for introducing the making of woodblocks to the United States. The art was pretty much abandoned in the western world after the northern Renaissance. A new appreciation of it surged in the 19th century when woodblocks were imported from Japan, which had an ancient and respected tradition in the genre. Dow absorbed the Asian applications, both mechanical and aesthetic, but didn't mimic them. Instead, he applied them to local subject matter and experimented with color combinations. The results were a beautiful blend of East and West. Dow, a writer and teacher, inspired other artists who adopted his principles and made them their own. Like Dow, and unusual for artists working in printmaking, they performed all the steps themselves, drawing the design, carving the wood, inking the block and pressing the print. It allowed them great control over the results and allowed for innovation and experimentation with paper absorbencies and tonal variations. The woodblock printing process is straightforward, but when you visit the exhibition, take time to study the different approaches the artists took within its strictures. Also notice how the intensity of colors can differ depending on subtle things like the pressure applied during printing; a work can have the density of an oil painting or even more transparency than a watercolor. The accompanying catalog is small but has color reproductions and provides good context. Its informative essay is short enough to read before or during your walk-through.